Blauweiss Films will host two fall events featuring new film segments to contribute ideas to. Unlike most filmmakers who present polished completed works, Stephen Blauweiss likes to screen his creations a segment at a time, inviting the community to comment and participate. Sharing his vision a segment at a time is how Blauweiss also made his last film, “The Lost Rondout: A Story of Urban Renewal,” which he co-produced with Lynn Woods. The 2016 film detailed urban renewal efforts that razed waterfront streets in the Rondout section of Kingston, offering lessons in conscious planning by capturing what was lost. A segment of the company’s next documentary film-in-progress, “Kingston: Reinventing An American City,” will be shown in a Celebrate Kingston event from 7 to 9 p.m. on Sept. 23 at Gallo Park in the Rondout section of Kingston. The film focuses on the changing face of Midtown Kingston, recently designated an Arts District. The event will feature rare photographs of lost local architecture, including interior shots of the iconic Post Office (below), razed over 50 years ago, but not forgotten. Growing up in New York City, Blauweiss noticed first hand how neighborhoods can change in both good and bad ways. This led to an interest in the city’s architectural legacy and that interest extended to Kingston’s history when he moved there in 1999. When buildings disappear, the stories of those who lived and worked in them can also be lost, said Blauweiss. Learning about a city’s architectural history can strengthen your appreciation of where you live. Artist and entrepreneur Berelowitz began working with Blauweiss in January 2017, after a decade working for nonprofits in Washington D.C. During a summer break studying meditation at The Omega Institute, she decided to make the Hudson Valley her home and eventually opened a store on the very Rondout street reshaped by urban renewal. It’s not that urban renewal had evil intentions, she said, but there is a lot to learn from where it fails, both in preserving history and providing housing for the people it displaces. Blauweiss Films will host a second free Kingston event on October 21. 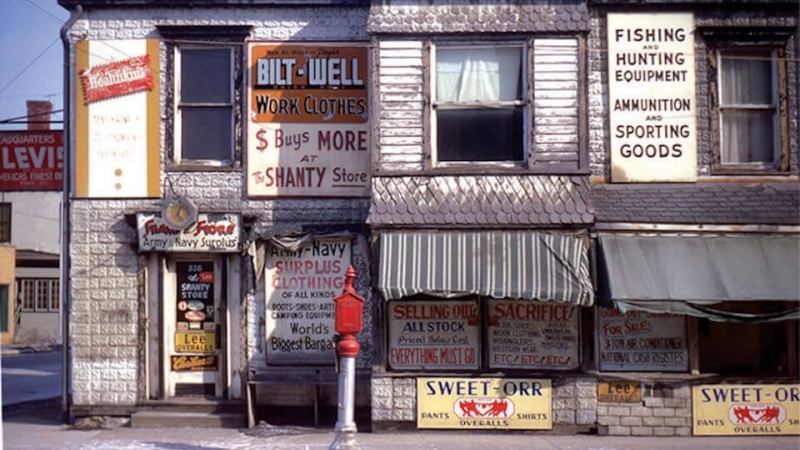 The multimedia photo exhibit “Kingston: An Architectural Legacy Then & Now will take place from 7 to 9 p.m. at 33 Canfield Street in midtown Kingston. An Woodstock event on Nov. 4, focuses on another Blauweiss film-in-progress, “Woodstock: 100 Years of the Art,” which highlights the village’s creative institutions. Between working on feature-length films, the filmmakers craft short artist profiles, some of which appear on the PBS station WMHT. Blauweiss produces a monthly Art Scene video web series, with profiles on Hudson Valley artists, museums and galleries. Berelowitz, the subject of one of those profiles, sells the products she designs at her online business Karmabee. The filmmakers hope they can inspire a thoughtful approach to city planning. To that end they plan to open a museum focused on the Hudson Valley’s diverse architectural landscape at the Fuller Factory building in Midtown Kingston. This story was originally published by Hudson Valley Magazine.